On average there are up to two killings a day in Los Angeles County. 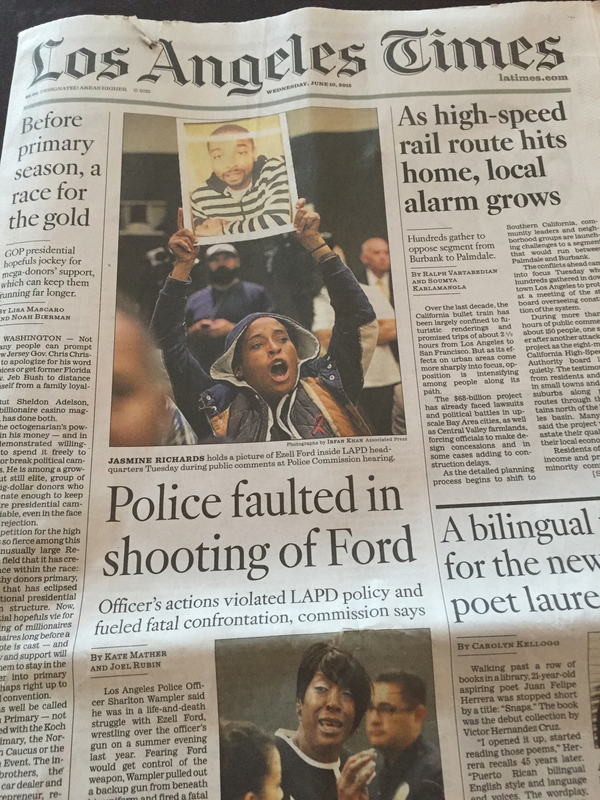 And all of them are faithfully reported in a grim Los Angeles Times blog The Homicide Report. I visited recently with the Homicide Report’s main staff writer, Nicole Santa Cruz. Although she’s a reporter, her station is appropriately located within the data desk sector at the Times. While Cruz reports each murder, she is surrounded by web producers and data specialists who package that reporting into dynamic and interactive digital content. On this morning, no surprise, she is busy tracking down another murder. The news was delivered to her by an advisory e-mail from the Los Angeles County Sheriff’s Department, one of her many sources. She also scours periodic data dumps from police departments and the coroner’s office. Santa Cruz has been working on the Homicide Report for the past two years. “I think people really care about it. 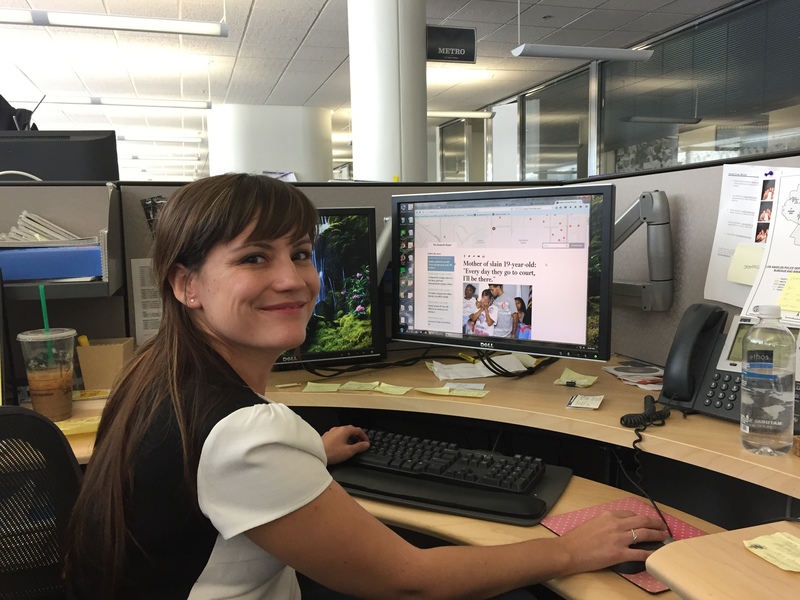 The people who it really impacts are super grateful it exists,” says Santa Cruz, pictured at her desk, below. She keeps a master spread sheet of every killing in the county that includes basic information such as victim names, coroner case identification number, and the location and time of each murder. In addition to the basic cataloging, Santa Cruz or someone from a team of reporter trainees at the Times aims to write a full story about every murder. 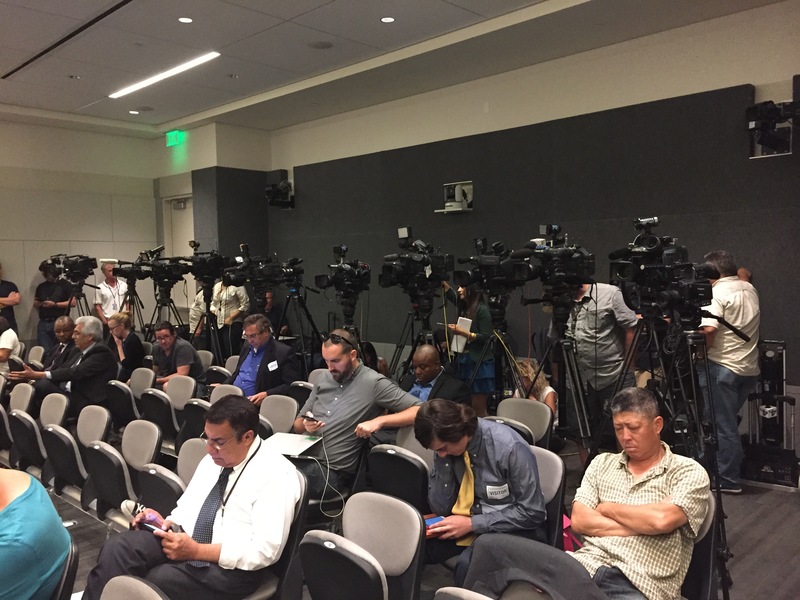 That means tracking down family members, investigators, medical examiners, street sources and anyone else who can shed light on how yet another luckless person in Los Angeles County met with fatal violence. 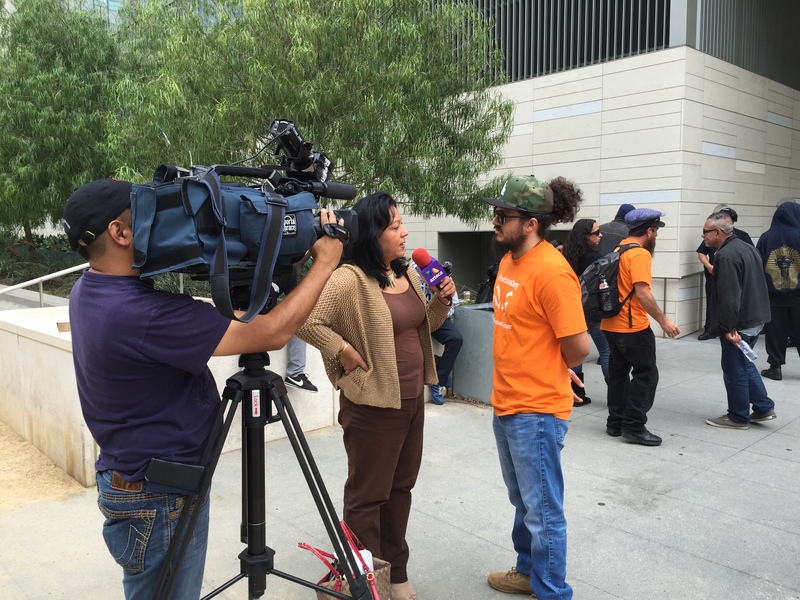 The Homicide Report is a blog that takes full advantage of its digital format. In addition to posts about each murder, there are digital extras such as a searchable database and an interactive map showing every homicide in the past 12 months. That’s 550 and counting. The blog, which started in 2007, is more than a public service. It also generates enterprise stories. Sometimes Santa Cruz will step back from daily reporting to examine patterns within all the data collected by the Times. That often yields important trend stories on homicides in the county. Last year, for example, she noticed that victims were skewing older. So she wrote about this trend in a Report post. She also wrote a story about the tiny community of South Vermont Avenue when she noticed from map data that this was the deadliest place to live in the county. The report, she said, came as a surprise to even some of the sheriff’s deputies who patrolled there. “What’s really cool about this database is that it combines the best of old school reporting with the tools of what we now have at our disposal,” she says. 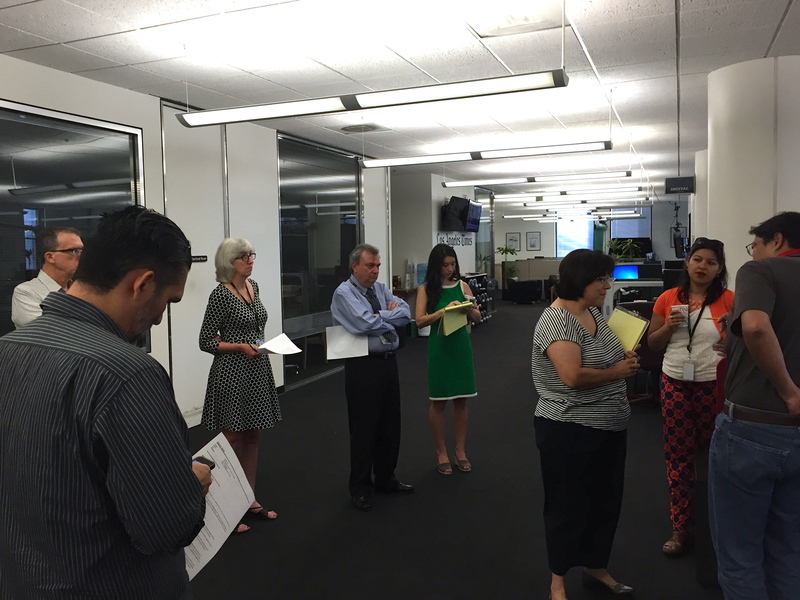 In a corner section of the main editorial floor at the L.A.Times is a mini television studio. It’s surprising to come across it because so much of the editorial office space still feels like a print-only operation. But sectors of the cavernous building are devoted to video production. The Times embeds a lot of video on story pages, has a section devoted to video on its main site, and has a strong presence on video outlets such as YouTube. The studio is used for live or recorded interviews on the small set, which features three cameras, a bank of lights, a small table and a backdrop featuring the Times logo and brand signage. 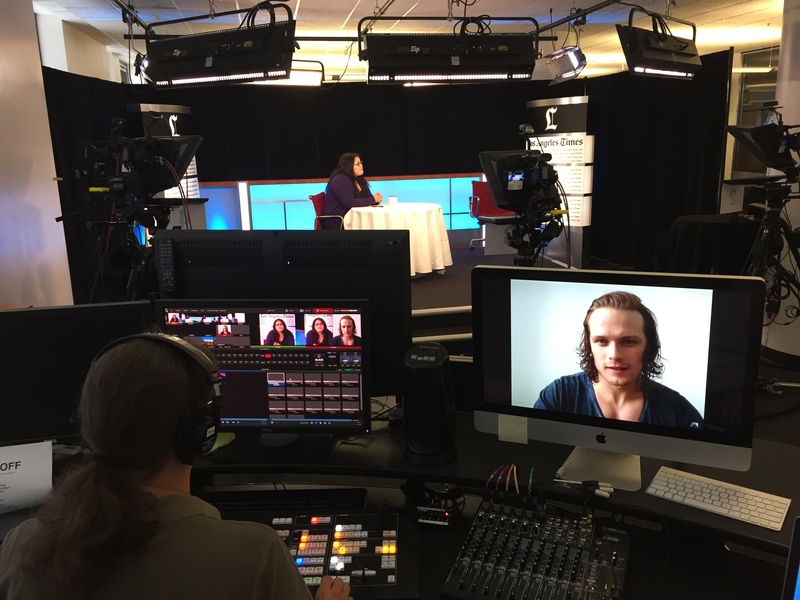 Everything is ready to go this Monday morning with a live online broadcast of a chat between Outlander actor Sam Heughan and entertainment reporter Yvonne Villarreal. Well, almost ready. Heughan, who will be appearing via Skype, is late connecting with the Times team and the live interview will have to be delayed. The live chat has been widely promoted on Times social media and its online site, so this sets off a small panic as the team scrambles to get the word out to the many Outlander fans expected to tune in to the live event. Tweets are rushed out, headlines are changed, and the waiting audience is told to stay put for 30 more minutes. On mornings like this, the Times seems more like a broadcast network than a media company deeply rooted in print. Heughan finally connects on Skype and the live broadcast begins 30 minutes late. In the end it’s a success as the actor is engaged and personable. While Villarreal is doing the on-camera interview, Times web producer Tracy Brown is off to the side working her smart phone and busily tweeting out key moments from the interview. There is a heavy social media component for this broadcast. The live broadcast was facilitated using the Google Plus feature of Hangouts on Air. This seems like a convenient tool for student journalists to use to produce a live broadcast. The Times also got the audience involved. Smart. They created a hashtag before the event so interested viewers could submit questions to ask the guest when the interview started. Villarreal used a few audience questions during the interview, so this was audience engagement in action. When you integrate the live broadcast with your social media and digital product, as the Times does, you have a great way to boost page views and increase an audience. 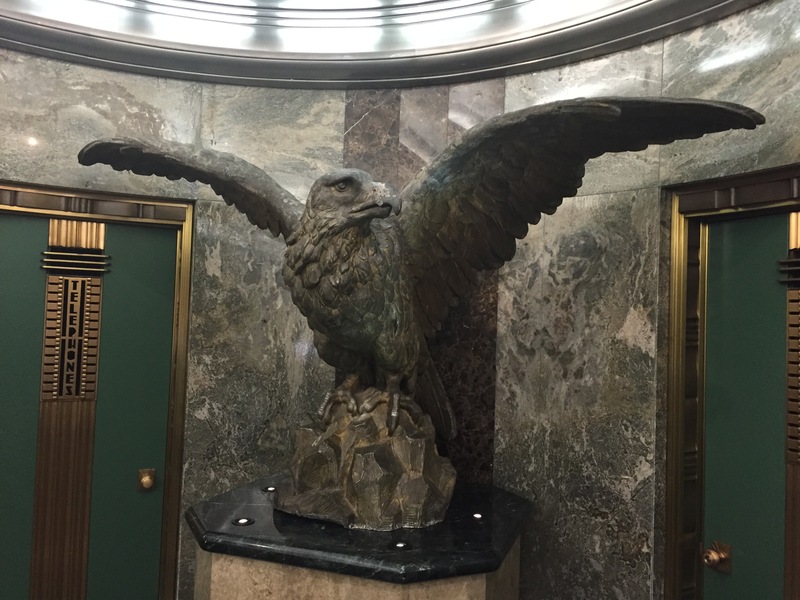 Walking into the Times building from the First Street entrance you encounter an impressive statue of a menacing eagle. It was designed by Gutson Borglum, sculptor of Mt. Rushmore, and it has a hallowed place in L.A. Times history. The eagle once perched on the roof of three different Times buildings before being moved into the lobby. A print representation of the eagle adorned the Times masthead for decades. It’s a symbol of courage and strength and a source of motivation as editorial workers step into the elevators and start their day working for a free press. As another source of strength, Times employees are all about the doughnuts and cake, which seem to appear out of nowhere at different times during the day. This being a newsroom, news of the treats spreads fast, and you have to be quick to grab your share. 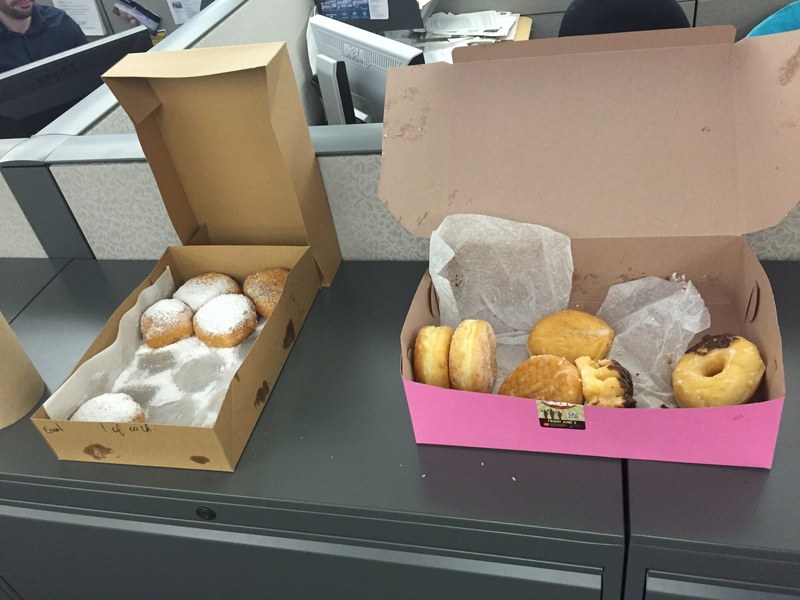 And speaking of which, today was National Doughnut Day, and during the morning editorial meeting it appears that the Times coverage of this special event was doing quite well with the digital audiences. 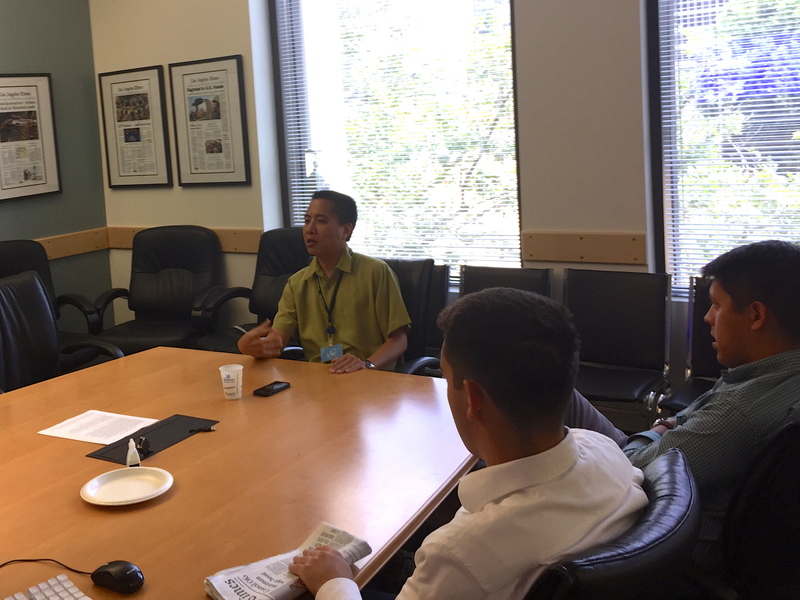 As another special treat today, the interns and I were invited to meet with Henry Chu, a longtime foreign correspondent with the Times, who just completed a Neiman Fellowship at Harvard University. Chu traced his history at the paper, a career that began in 1990 when he was selected for the Times’ Metpro program, designed to train young journalists and increase diversity in newsrooms. He was hired straight from that two-year program to work at the paper’s San Fernando Valley edition and then became a foreign correspondent in 1998. He’s worked in Beijing, Rio de Janeiro, New Delhi and currently London. He’s spending a few days at the Times office for some digital training, getting tips from the social media team on how to build a social audience and use Twitter as a reporting tool. He said that the best preparation for a career as a foreign correspondent is a good liberal arts education because it gives you the “critical and analytical framework” to view stories. 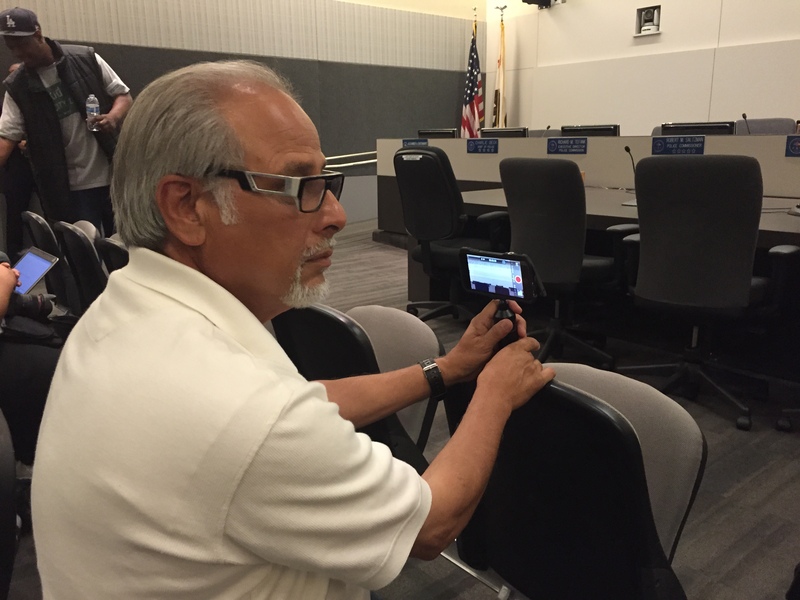 Chu mentioned that he also received training this week on using the mobile video editing app Videolicious, a program I also received some instruction on during my first week from video editor Robert Meeks of the Times. It’s for fast, in-the-field video editing that you record with your cell phone. I practiced with it to create a 30-second video on the Grand Central Market, so now I feel ready to use it on a story if called upon. I will be heading out to produce a short video for a story on Monday. I also contributed to one of the Times’ many subscription newsletters, a growing area of focus for the media company. The Times editors feel that these newsletters, which arrive daily in the form of e-mail, are a great way to expand their market to new audiences. They are basically curated lists of links to stories of interest on a variety of topics, including breaking news, politics, entertainment and travel. I was asked to contribute some ending bright items to the Essential California Newsletter. Here is my first one. All in all, a very exciting and interesting first week!